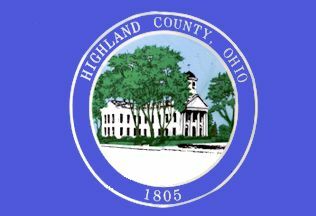 The Highland County flag features a round picture on a blue background. The center image shows the county courthouse surrounded by trees. Built in 1832-34, the Highland County Courthouse is Ohio's oldest courthouse in continuous use as a courthouse. Highland County was established in 1805. Its name is a description of the local terrain which divides the watersheds of the Little Miami and Scioto Rivers.